The holidays are right around the corner and this is the season of giving. Why not combine the two with a family-friendly charity event? The Festival of Trees is a five day festival held in Gatlinburg from November 22nd to the 26th. It is a great way to both celebrate the holidays and make a difference in the local community. This festival kicks off the Thanksgiving celebration in the area. It benefits the Boys & Girls Club of the Smoky Mountains, which helps fund enrichment programs for more than 1600 children in Sevier County. Last year, the Festival of Trees event was able to donate more than $30,000 in proceeds to the club. This year festival organizers would love to top that number, but they need your help. So what does this festival have to offer you and your family? The event kicks off with a preview party, the Candy Canes and Cocktails Reception. This is held in the evening on the 21st and starts at 6 PM. Here you can meet people, enjoy the event’s signature cocktails, and participate in the silent auction. Bid on your favorite Christmas tree and you may end up taking it home after the festival! Tickets are $35; please RSVP in advance. The next day, on Wednesday the 22nd, the Festival of Trees officially begins. The venue is open all day, from 10 AM to 7 PM, with fun activities for the whole family. The festival itself is free and a great diversion for both locals and families visiting Gatlinburg during this time. While you’re taking in the festival, keep your eyes open for costumed performers, carolers, and more. You never know who will show up; sometimes celebrities drop by to share in the holiday entertainments. The festival has something for everyone. Kids of all ages can enjoy the children’s craft and play area. It wouldn’t be the holiday season without Santa. Would your kids like to meet him in person? There are several Santas spreading holiday cheer throughout the event from the 24th to the 26th. Check the event schedule for when he’s available to guest star in family photos. Meanwhile, on the 25th there are two breakfast sessions scheduled with Santa. Here, your children can have a pancake breakfast, meet Santa and give him their letters, and receive holiday treat bags. Tickets cost $15 and are limited, so book early. 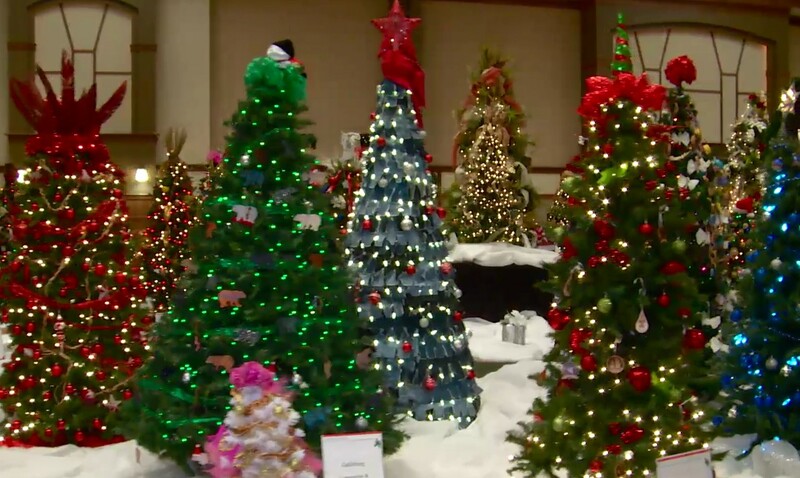 The Festival of Trees is held at the W.L. Mills Conference Center, which is next to Gatlinburg’s Convention Center. Ample parking is available through the city parking lot on Reagan Drive. Entrance is free and donations to the Boys & Girls Club are always welcome. Finally, if you’d like to help more, you can sponsor a tree. Several sponsorship packages are available. You can find out details on the festival’s website.